One of the aspects for me of a day of reporting on and reflecting about digital humanities while doing digital humanities is to feel more intensely what it means to be switching back and forth between different worlds, over and over again, multiple times a day. It means trying to find my footing when plunging forward into working with digital tools that are still way too sophisticated and over my head in terms of their inner logic, and then later getting requests from colleagues to help them with technical issues that have long since become basic to me but seem baffling to them. It means having to rethink everything I know about university teaching in order to prepare for next semester’s classes while working in settings where the professors who trained the professors who trained me and my colleagues could step into most classrooms and pick up where they left off without skipping a beat. It means having to travel back and forth from the open online world where all sorts of people are thinking out loud together to the closed physical settings of campus worklife which run by the rules of the old boys’ network of 1950s America. One of the hardest spaces to negotiate, though, is explaining why it is that I think that “digital humanities” is the vernacular that those with specialized knowledge in the humanities need to learn to speak. (That there is a digital common tongue seems clear — a low-brow world of selfies, lol cats, trolls, and students facebooking in class, perhaps?) But the “digital humanities” seems forbiddingly extra-specialized, imported as it is from the realms of computer science. Sporting arcane identifiers such as Ngrams, ArcGIS, Gephi and TAPoR, such tools seem intended to transform the “humanities” into the “mechanicalities” by mining text and programming data visualizations and who knows what else. No vernacularity there, only the in-group mystification that comes from speaking in 1s and 0s. I guess what I am trying to get relates to the idea that increasingly, “common,” “local,” “everyday” knowledge is mediated by digital means, creating a digital vernacular that has different characteristics in its many-to-many communication dynamics, rather than the few-to-many directional realities of television, radio, movies, and print — and the university — (giving rise to a phenomenon that journalist Jay Rosen termed “the people formerly known as the audience” in 2006). Among other characteristics, the digital vernacular is a space in which people expect to be able to be active participants if they so choose. Digital tools of all kinds allow them to create, experiment, extend, improvise, share, and explore. I think that playing with the digital humanities toolkit, especially in its ability to accommodate spontaneity and bring a sense of surprise and discovery to humanities scholarship through the hypothesis-generating possibilities it provides, comes close to speaking in the digital vernacular. Encouraging peer-to-peer learning, it can upend our ideas of who properly can be our peers, and provide the means for setting off on explorations together with non-specialists. Where the traditional model of learned specialist lecturing to novices who are just passing through our Gen Ed courses may have made vernacular peerage difficult to imagine, the tools in the digital humanities “toy chest” may shorten that distance and bring new possibilities into view. 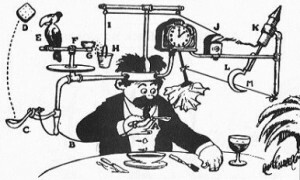 From this perspective, it’s not that digital humanities tools are pointlessly epicyclic, as many humanities scholars still suspect — encouraging Rube Goldbergian ventures at odds with the powerful simplicity of the professionally-trained mind encountering a fragment of the human record and bringing forth knowledge as a result — but rather that they can open up collaborative opportunities to work at scholarship with members of the wider public. Why would we want to do this? Deep down, it just seems to me that this is our remit as educators: to make the humanities as widely available as possible, not simply for others to consume but so that they can make fuller use of the creative possibilities they contain. For much of the span of modern professionalization, we scholars have assumed that these creative possibilities belonged to us, really, because of the long, exacting apprenticeships we were required to undergo. The agreement was: we would spend our lives in study on behalf of society and we would dedicate our scholarship to advancing the frontiers of knowledge; in turn, society would support us financially. 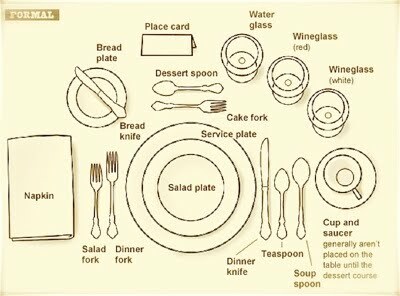 Sitting at the High Table of knowledge, our apprenticeships had given us the ability to negotiate the intricacies of humanities a la Russe with ease; everyday thinkers, however, likely found the elaborate tableware and its placement baffling. But it was enough that they helped to pick up the check. There is a lot to say about why that formulation is not very helpful in this era. But for today, one part of the answer that keeps knocking around in my mind is that it is too much about us, and not enough about others. What if digital humanities gives us the ability to rewrite that compact between academia and society, in such a way that we recognize that part of our job is not simply to do humanities research on behalf of others, but to enhance the opportunities of others, in various ways, to be humanities researchers themselves? One of these days, I am going to be able to explain this…or maybe the point is just to get on with trying to make it happen. 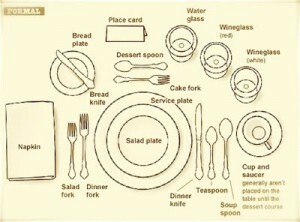 Images: Formal dining service layout from Carmen Rodriguez via a CreativeCommons Attribution 2.0 Generic license and the Rube Goldberg image via Wikimedia Commons. This entry was posted in Uncategorized on April 9, 2014 by Katherine Pandora.